While I'm far from a makeup pro, I do have the knowledge I've gained as a 10-plus year user of makeup. I remember buying my first foundation in college, right around the time that Ulta and Sephora were becoming a big deal. I chose a powder foundation from Benefit, and felt like a real adult putting it on each day. I had worn mascara and eyeshadow (and lots of body glitter) in high school, but the Benefit foundation was the first time I had a real "makeup routine." I've since moved on to being a liquid foundation user, and have a makeup routine that I use pretty much daily (which I talk about here). I've also moved on from using my fingers (or the sponge that comes with the foundation) to apply my makeup. There's nothing wrong with using your fingers to apply, but I worry a lot about spreading acne or any germs/bacteria around my face. I also think you get a less "makeup-y" look when you use brushes - it blends in more and doesn't just sit on your face. 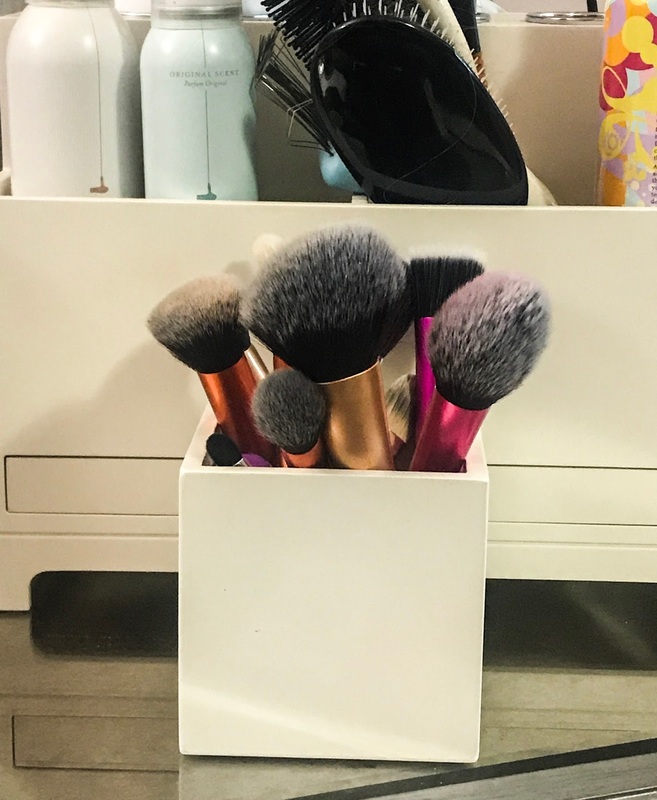 My favorite makeup brushes are the Real Techniques brushes - I basically use them for every step of my routine. I think they're incredibly affordable, which is important for something that might not last if you don't clean them regularly. And even though they're affordable, they also hold up really really well - I have one of their Expert Face brushes that has lasted me over three years now. Either the Expert Face brush mentioned above, or the Buffing brush. The Expert Face gives a bit more of a full-coverage appearance, while the Buffing brush gives a lighter, sheerer finish. Which brush I use depends on which look I'm going for! I use powder all over my face, not just in small areas, so I go for a big brush with lots of coverage - the Powder brush. I use the aptly-named Blush brush. I really like the angle on this brush - it helps you follow the natural shape of your cheekbone, without getting too clown-like with your blush. Do you have a favorite brush/brand of brushes, or are you more a Beauty Blender person? Let me know in the comments!